«This is a significant release. 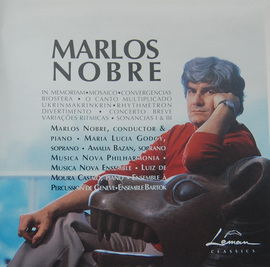 Marlos Nobre is the best-known living Brazilian composer, many deem him to be the heir to Villa-Lobos. This two-CD set surveys a wide range of his music from 1963-80, Nobre not only as composer, but as conductor and pianist... Nobre is first of all a modernist. Growing up as a composer in the 1960s, he was inevitably attracted to the experiments of the avant-garde, especially the techniques for manipulating timbre and texture of the Polish school. Works such as Mosaico and Concerto Breve show his interest in this new sound world... Like most composers of the time, Nobre was attracted to serialism, but he apparently never adopted it ina doctrinaire manner. The Variacões Ritmicas for piano and percussion is an excellent illustration of his approach ‹ steely atonal lines in the piano surrounded by compelling motoric rhythms and bright colors in the percussion, a successful blend of a modernist technique with more folkloristic materials.